The 2 minute instant noodles. The children’s delightful food. Our from the shelves of kitchen on last Tuesday. 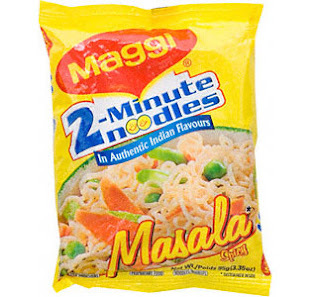 State governments from Delhi to Kerala, and from Tamil Nadu to Haryana, Maharashtra and West Bengal, deployed officials to randomly collect Maggi samples of different batches and dates for testing the safety of its content. Delhi health minister Satyendar Jain said, "Last week, we lifted 13 samples of Maggi for testing. We found the masala samples, tastemakers of at least 10 such packets, had lead content beyond the prescribed limit of 2.50pm." Jain also said five samples of masala were found containing Monosodium glutamate (MSG) without proper label declaration. From MSG you’ll face these some problems. Now Maggi is banned for 15 days and out from market.